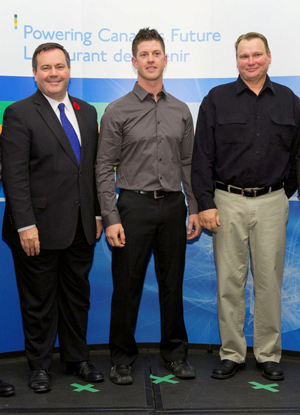 AltaLink, Alberta's largest regulated transmission company and a member of the Canadian Electricity Association (CEA), was honored to accept the bronze CEA Vice President's Award of Excellence for Employee Safety on November 5, 2014. "This award truly reflects the value of safety at AltaLink," said Rod Kause, AltaLink's vice president of environment, health and safety. "We encourage all employees to not only work safe, but to live safe as well." The CEA's annual occupational health and safety awards ceremony recognizes excellence in employee safety in the Canadian electricity sector and honours CEA member performance. In 2012, AltaLink was recognized with the silver award from the CEA President's Award of Excellence for Employee Safety and a bronze award from the Vice President's Award of Safety Excellence. AltaLink's transmission system efficiently delivers electricity to 85 per cent of Albertans. Dedicated to meeting the growing need for electricity, AltaLink connects Albertans to renewable, reliable and low-cost power. With a commitment to community and environment, AltaLink is ensuring the transmission system will support Albertans' quality of life for years to come. Learn more at www.altalink.ca. Pictured left to right: Honourable Jason Kenny, Minister of Employment and Social Development and Minister for Multiculturalism; Eric Cowger, AltaLink Transmission Lineman; Ted Graham, AltaLink, Senior Transmission Lines Work Specialist.